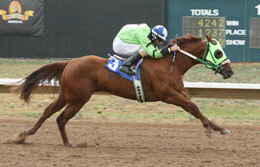 Kaul Wave, under jockey Francisco Raul Ramirez, Jr., sets a new track record in the Merial Arapahoe Distaff Challenge. AURORA, CO�JULY 6, 2013�Kuhl Wave established a new Arapahoe Park track record for Quarter Horses at 400 yards in dominating the $26,370 Merial Arapahoe Distaff Challenge for fillies and mares on Saturday at the Aurora, Colorado, racetrack. With the win Kuhl Wave earned a berth to the 400-yard, $125,000 Grade 1 Merial Distaff Challenge Championship on Quarter Horse racing�s championship night at Los Alamitos Race Course in Southern California on November 9. Kuhl Wave, a 3-year-old sorrel WAVE CARVER filly owned by Miguel Banuelos, trained by Jose Aguilera, and ridden by Francisco Raul Ramirez, Jr., flew out of the starting gates and pulled away for a 3 3/4-length win in a time of 19.149 seconds as the 3-5 favorite. Shesnosecretary, an 8-year-old mare who was making her first since November 2011, finished second for owner Saul Reyes, trainer Gene Salazar, and jockey Jaciel Soto. Hooray Cowgirl was third. The previous 400-yard Quarter Horse track record at Arapahoe Park of 19.329 seconds was set by Purely Prada in the Mile High Derby on August 9, 2009. Completing the field were Breitling Time, Solid Anita Jo, Sixsito, Arriba Cole and SS Black Corvette.